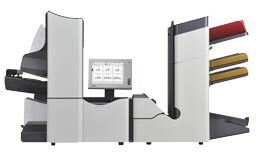 FP Mailing’s top-of-the-line folder-inserter, the 6600i can assemble and finish mailings at a stunning 4,300 letters per hour. It ensures that businesses with high volume mailing requirements can process even complex mail pieces efficiently and reliably. The 6600i makes configuration and operation easy with a generous 10.4” color touch screen and automatic job setup. Weight (3-4 stations) 274 lbs.